Ok, so I know we’re all trying to cut back & slim down for summer. & you’re desperate for moreÂ recipesÂ to help you on your way. Come on! Would I do that to you? This gorgeous, healthy plate of food only has around 400 calories. It’s wheat, gluten & carb free. So what makes it so skinny? The ‘pasta’ is in factÂ thinly sliced, steamed white cabbage. 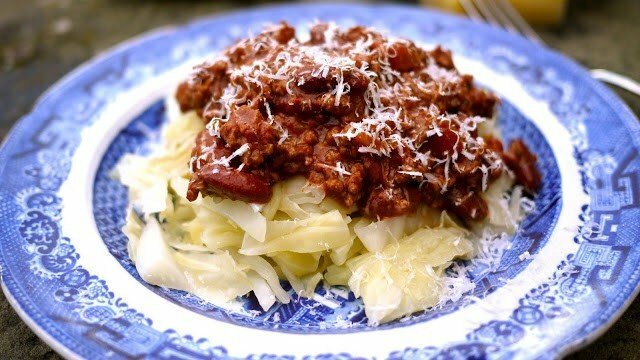 It’s cooked quickly with zero fat, meaning it still holds a little crunch, has almost no flavour (I hate cabbage usually) and works as the perfectÂ vehicleÂ for theÂ sumptuousÂ chilli on top. It’s one of my mums tricks & I was totally unconvinced, but gave it a go & I’m now a total convert. I might even prefer Skinny Spaghetti to standard fatty spagetti. The chilli is the only part of this recipe that really takes work. It’s my world famous chili. It may take a little love & attention, but this recipe makes enough to serve 4 people, with more left over for freezing. You can use it in burritos, tacos, jacket potatoes or serve it on rice with fresh guacamole & sour cream. Give it some love & it’ll love you right back! Place a large, heavy bottomed saucepan on the heat. When it’s hot add your oil. Just about 2 tablespoons, remember there’s fat in the meat. Fry your onions until soft and add your garlic. As soon as they look like they’re about to turn brown, add your mince. Keep stirring and moving it around the pan until it browns. Now, sprinkle your cayenne pepper & smoked paprika over the top. 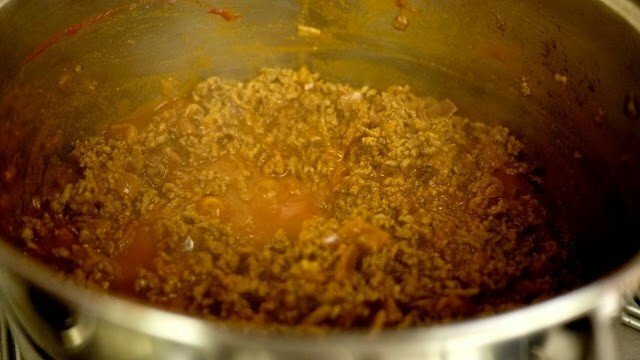 Stir it all in and keep it cooking away until the mince starts to turn a dark brown & you see juices bubbling up from below. Pour in the wine (pour yourself a glass while you’re at it). Keep stirring for about 5-10 mins, to allow the alcohol to cook away. Add your chopped tomatoes, tomato puree & honey. You guessed it, stir! Add your BBQ sauce & Siriacha. Leave this bubbling away for a couple of minutes. Turn the heat down as low as possible, cover the pot & leave cooking away for about an hour (2 if you have time), stirring now and then. After an hour, add your fresh chillies, your kidney beans, your cocoa powder and a big pinch of salt. Cover loosely & leave to cook for about an hour. By the end you should be left with a rich, dark coloured chilli which will smell amazing. It should taste smokey, sweet, spicy & very very meaty! If you’re not happy with it, play around. Add more honey, or hot sauce or salt, whatever you think it needs. It’s all down to personal taste. Thinly slice your cabbage, throw it into a hot pan with your water and salt. Let it steam away for 5-10mins. It should be al dente and I like mine after 5mins, but I’ll leave it to you. Drain any excess water & voila! I know this goes against your usual dieting instincts but freshÂ parmesanÂ will give you a much stronger cheesy hit, with far fewer calories. The best ‘diet foods’ are the ones that make you feel like you’re not missing out at all. SkinnyÂ SpaghettiÂ is great because it feels utterly indulgent, but is totally guilt free. The chilli can be stored in an air-tight container in the fridge for up to a week & in the freezer for about a month. If you already have your chilli stored away in the fridge, this is pretty much the quickest, healthiest meal you can whip up when you get home. Faster than pizza & much, much skinnier.